Winding down, but still some berries out there for you! Thank goodness for the rain Friday night. We hadn’t had a speck in 18 days. 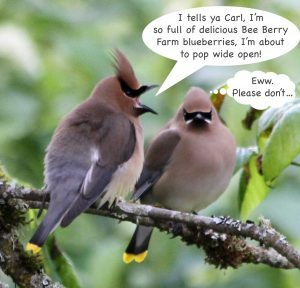 And the birds…flocks of Cedar Waxwings have found us. There are still Blueray and Darrows (plus others scattered through the field) and they are certainly plenty sweet at this point. So if you’ve still got a bit of space in the freezer or fridge, please join us for our last week of picking this season. Will try to get some yummy honey extracted as well! We appreciate our loyal pickers as well as the wonderful new folks we’ve met this season! 7/8 Sunday CLOSED for maintenance! 7/10 Tuesday: 700 a.m. to 12:00 noon + last evening pick of the season 4:00 p.m. to 7:00 p.m.
← Bluecrop! Blueray! Blueberry pie for (after the) 4th of July!